persons (even 3 persons with seat). Their surface areas vary from 85 to 110 m2 for the 5 gites and more than 200 m2 for the big gîte. Some gîtes are interconnecting, they are gites "L'Auro" and "La Magnanerie". Studio flats have a surface area from 30 to 35 m2. ** Gite where the disabled can have easily access. 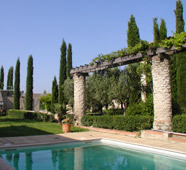 Rentals are fitted with quality furniture and a customized interior decoration in Provence style. Each accommodation includes a fully-equipped kitchen (with domestic appliances : cooker, microwave oven, dishwasher, fridge, deep freeze, induction cooking plates, etc). Each gite and studio flat has a private terrace with a teak garden set, parasols and a barbecue set. tumble-drier, clotheshorse, washing powder supplied). temperature during the hottest days of the summer. Rentals are located on the ground or the floor above. Gites and studio flats are no smokers. No pets allowed except under special conditions.